Kihei, the town home of Maui What A Wonderful World Bed and Breakfast, is known for beautiful beaches and beach activities, but some people come for the Golf. 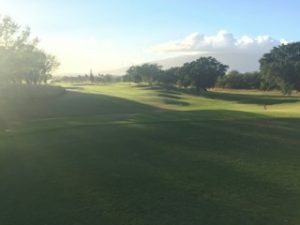 Wailea and Kihei known as “The South Side” of Maui have many beautiful golf courses and quite a few are within minutes of this Maui Bed and Breakfast. The game of golf has become a pricey hobby but just minutes from the front door of your suite at this Bed and Breakfast Inn is a great course, with beautiful greens and even better views and best of all,very reasonable rates year round. Jim and I frequent the driving range of Maui Nui Golf Course with our 2 and a half year old grandson. We have yet to find a time when we can’t find at least one open spot. We can spend hours here just practicing our swings. From the driving range we start our 18 hole maui golf experience on this side of our beautiful island of maui. The course is an easy play and a great way to spend an afternoon. Prices drop significantly after 2pm and in the summer you can walk the course after 3pm for super great rates. Most guests can golf for $80 or less year round. This rate includes the cart. 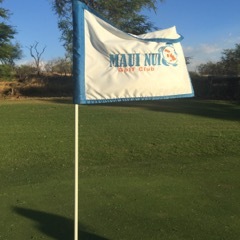 There are courses with even better views and more eleborate markers and carts than Maui Nui, but with the great rates at Maui Nui, it is a locals favorite. Kono’s Restaurant at the club house of the course has great sushi, steak, and seafood. We have had some very good salads here. Sunday nights are reserved for Jazz and they usually require a cover charge. Any other night is open. The restaurant sits at the top of the 1st hole and the bottom of the 9th. It s great for starters or to grab something quick to push you through back half. After 18 holes a great Ahi Steak is always a delight.